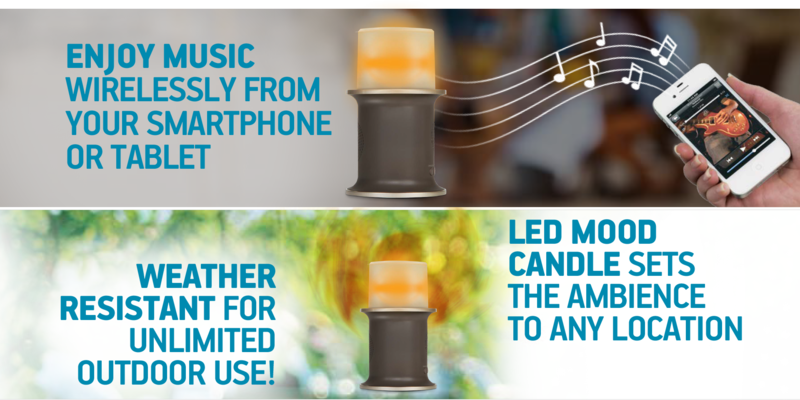 The Acoustic Research Wireless Candle LED Speaker was designed to blend into any home environment while offering excellent sound and a serene form factor to help you relax. This speaker adds acoustic flare with 4 watt sound and equipped with LED candlelight will help set a calming mood to make your space cozy. The compact design is perfect for indoor use in the living room or kitchen, but is durable enough to stand up to the outdoors on a patio or next to the pool. This wireless speaker also has a built in rechargeable battery that offers up to 12 hours of playback. This product epitomizes AR's philosophy of product development: close attention to design as well as performance, resulting in great wireless audio combined with elegant design that matches its surroundings. Pairs easily with several different Units, Good Fidelity, voice warns when battery needs charge & runs long time on single charge, provides good sound direction. First Bliss worked fine for a few weeks then Light Switch failed to turn light out & nothing could be done to turn off. BB&B exchanged . Has most of what I was looking for in a small speaker, but is quite loud, and does not have a volume control. My satallite radio has limited volume control, and even on the lowest setting, it's too loud. Definitely not for the office or background music.